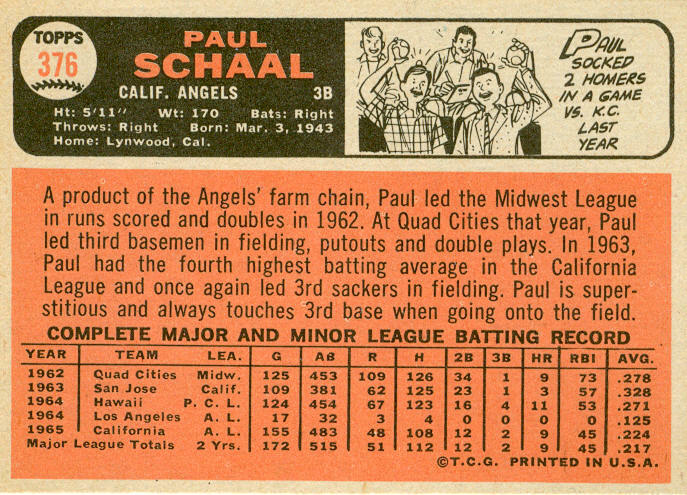 Here is the 2nd of 3 Angels in the All-Rookie subset - 3rd baseman Paul Schaal. 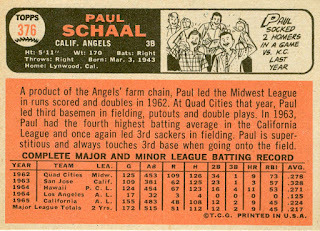 Schaal was signed by the Los Angeles Angels in 1962, and played 3 seasons in their minor-league system, mostly as a 3rd baseman, but played over half his games at 2nd base in 1964. He made his big-league debut in September 1964, playing 17 games for the Angels (starting 7 games at 3rd base). 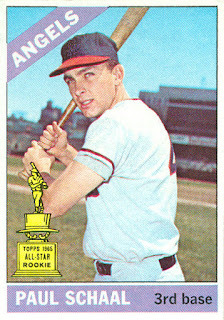 Paul opened the 1965 season as the Angels' starting 3rd baseman, and started 150 games at the hot corner. 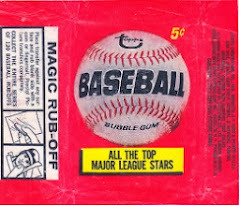 He hit 9 homers and collected 45 RBI in his rookie season, but only had a .224 batting average. 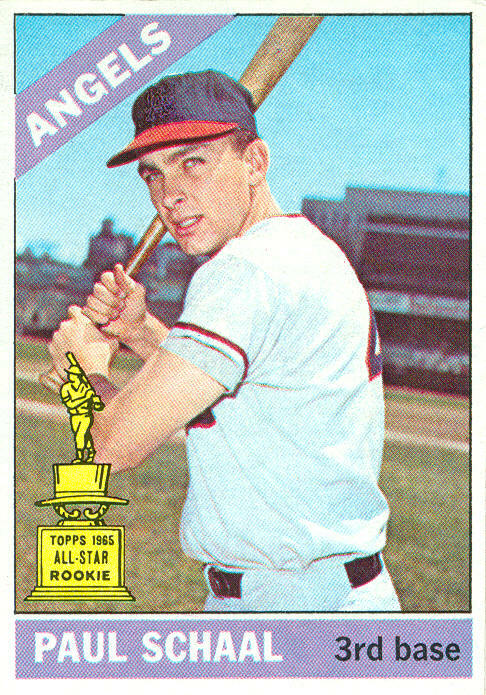 Schaal's playing time and production dropped in 1966, as the Halos acquired 11-year veteran third-sacker Frank Malzone from Boston to help out. 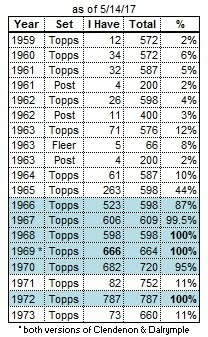 Schaal started 110 games to Malzone's 32, with C-3B Tom Satriano starting the rest. With Malzone's retirement, Schaal was back in the driver's seat to start the 1967 season, but by mid-July he was relegated to the bench for the remainder of the season. The team patched together a mix of Woodie Held, John Werhas, and Satriano at 3rd base for the next 6 weeks, then called up rookie Aurelio Rodriguez on September 1st. 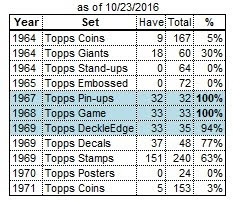 Rodriguez started 29 of the final 30 games at 3rd. Paul was back as the starter in April 1968, but was beaned by Boston's Jose Santiago in mid-June [payback for Tony Conigliaro's 1967 beaning? ], costing him the rest of the season. Rodriguez was called up to replace him, which marked the end of Schaal's tenure as the Angels' 3rd baseman. Schaal was selected by the Kansas City Royals in the expansion draft, and spent the next 5 seasons with the Royals. After backing up Joe Foy in 1969, he was the team's primary 3rd baseman for the next 4 years, and started every game there in 1971. Schaal's last season in KC was 1974. He started 12 of the 19 games in April at 3rd base, then rookie George Brett was called up, and made his first start on May 4th. The rest is either "history", or "bad-news-for-Paul-Schaal", depending on your point of view. Paul was traded back to the Angels on April 30th for outfielder Richie Scheinblum. He shared the 3rd base duties for the next 2 1/2 months with Bob Oliver and Dave Chalk. Schaal's final major-league game was on July 19th. He finished the season in the minors, and was released in October.